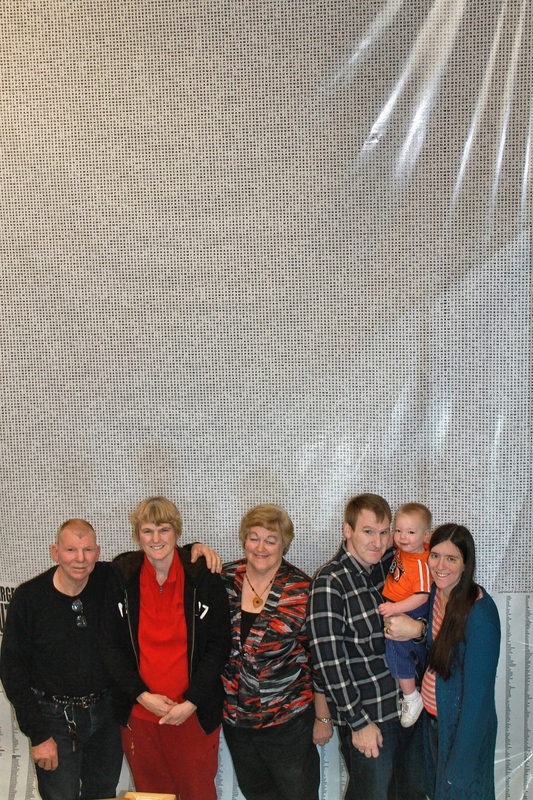 Mel Crow, third from right, with family in front of his world-record wordsearch puzzle. Breaking records becomes an act of spare-time madness when Mel Crow steps up to the plate. “The largest word search puzzle,” was his thought, and a decade later became so by his own vision. Crow’s lack of stimulation after finishing a lousy 20 by 20 word search brought him to the question, “What if? What if there was a wordsearch so big you couldn’t even see the whole thing at one time?” This led to a casual beginning of building. The graphic design and advertising instructor placed word after word into a square structure. Letters grew from hundreds to thousands to create the ultimate search. Breaking a world record didn’t cross Crow’s mind until he realized his own puzzle might be big enough to actually achieve that status. After research, a glorious statistic brought his hazy journey to a path with a clear destination. His initial puzzle, just over a thousand words, had already broken the record when the tenacious Provo resident thought, “I don’t want to just break the record, I want to obliterate it!” A new goal of 5000 words began pushing his project towards a finish line. His free time consisted of brainstorming categories and skimming the dictionary for the largest words he could find. Everything from World Religions to flowers to famous celebrities can be found in his sea of letters. “I kept adding section after section, it became a little addiction of mine. I would think I would be done but then think of another category to add. My wife was the one who convinced me to finally stop.” To make it his own, Crow says, “There are about 200+ words and phrases in there that only I know about,” including his own name, his wife’s name, and his son’s name. After ten years, on January 26th of this year Mel Crow made it into the Guinness Book of World Records with his 51,000 letter and 5,500 word wordsearch that was printed on a 10’ by 15’ banner at Eagle Gate College, where he teaches Graphic Design. As family gathered around to celebrate this moment, squinting eyes scanned the huge banner for words that would appear and suddenly disappear as they moved from one foot to the next. “No one will ever finish it,” laughs Crow, “It’s really just too big, plus if someone did I would have to check it, and I think I’m done checking wordsearches for a long time.” Despite his skepticism, online and print versions can be ordered on his website, not only in English but in American Sign Language as well. Although Crow thinks his record won’t last for long, as people have already called him for advice on how to surpass his achievement, his name on the Guinness Book of World Records is satisfying enough. His nostalgic thoughts surface into a simple smile. Mel walked out the door of his home that day of accomplishment with the banner in hand and a happy 18-month-old son impressively squeaking out “wordsearch!” while pointing to his Dad. Haylee Wilkes is the 15 Bytes summer intern. She’s a sophomore at Dixie State University majoring in Professional and Technical Writing. At Dixie she plays on the volleyball team and acts as a Student Ambassador for the school. Wow! I’m officially famous huh? The word search still holds the record, going past 3 years now! If you would like to order a print of the record breaking word search, or learn more about it and see photos please visit my site. Giantwordsearch(dot)com.